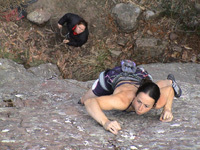 Heralded as the best climbing within walking distance of Halls Gap, the Watchtower offers some great single pitch mixed sport and trad routes all very easily accessible on a 40m high outcrop. 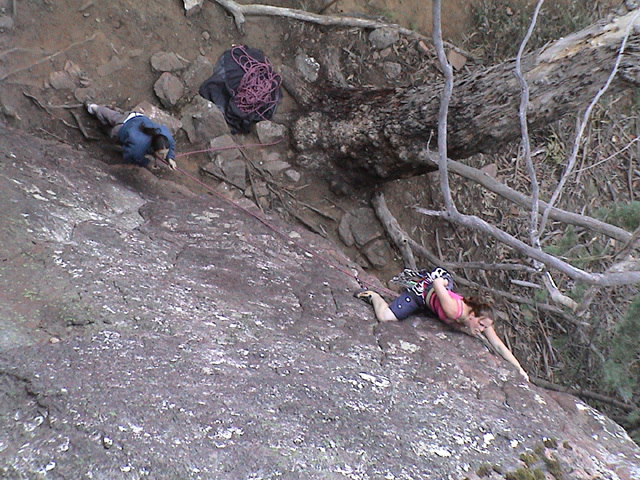 The area is shady and the grey rock provides some slabby to near vertical terrain with all the routes being close together, making it a fun place to come to tick a succession of short lines. If the weather looks too iffy for remote multi-pitch adventures or you've only got a few hours spare, this is the crag to choose. Right: Jacqui attempting My Friend Flipper (26). See the images page for the full sequence. The location can be found barely 1km down the "Mt Zero" road, which appears on your left, just before a bridge, as you depart Halls Gap heading back towards Stawell. (See: Approach Map). Park at the little car bay, then take the walking track up hill for about 300m. 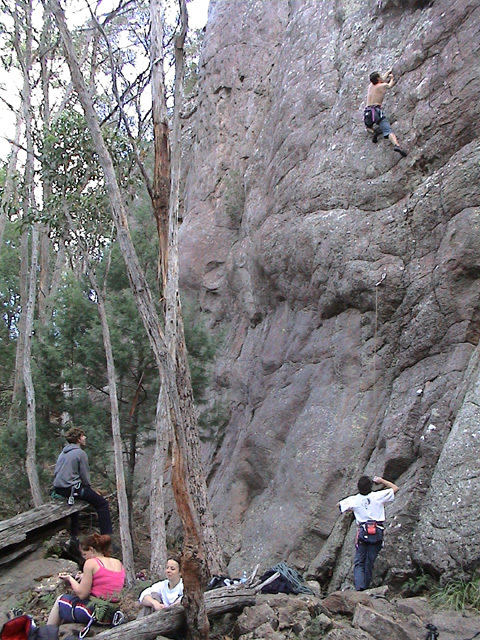 The first route you encounter is "Flying Buttress" 35m grade 14, that heads up the slightly detached pillar. To it's left you'll see the six staples identifying "My Friend Flipper" 30m grade 26. To it's right three bolts mark the start of "KY Valley" 30m grade 22. Continue walking left or right around the crag to access more quality routes. Above Left: Neil leading "My Friend Flipper" the 30m grade 26 with 6 bolts. It appears immediately on your left as you reach the crag. Above Middle: Purple Haze, 23m grade 24 appears a couple of routes left again and has two bolts near the start. Above Right: Moving left again you'll see "Couldn't Stand The Weather", 15m grade 22 which takes the arête past two bolts. 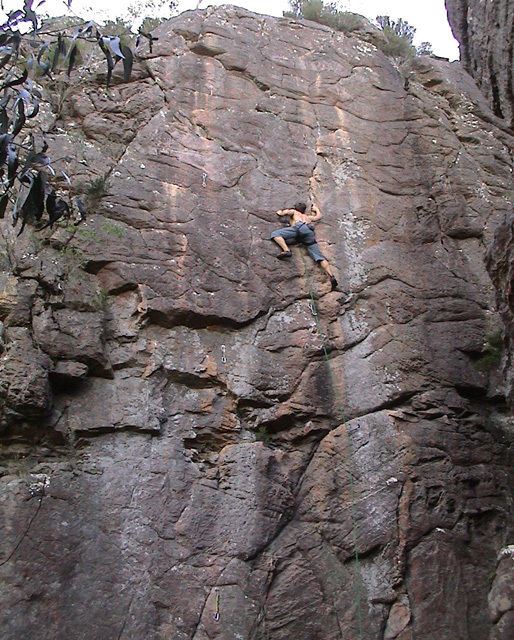 Above Right: Em leading Empty Pockets, 15m grade 18 with two bolts can be found high and left of the approach by walking clockwise around the crag. Just to it's right is a nice grade 15 corner crack. 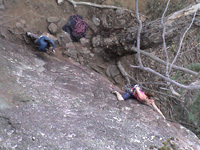 Above Left: Walking higher and clockwise again, you'll come across a secondary outcrop with two quality routes: "Silver Top" 20m grade 22 takes the rightmost line (Neil leading) past four bolts and "Jugular Pulse" the 20m grade 21 on it's left, heads up also past four bolts to a set of chains above. There's a wealth of enjoyable single pitch routes at the Watchtower. With access a breeze and the trees for shade you'll be tempted to hang out here all day rather than fight your way into some of the taller and more remote Grampians cliffs. The only thing I'd add about this area is that some routes look like they need small wires or micro cams for protection. Consult the Mentz & Tempest guide book for a detailed drawing of the crag. Have fun and climb safe! Grampians Selected Climbs - Guide book authored by Simon Mentz and Glenn Tempest and available from local climbing shops or the VCC.